Maradhi Manni: India Is Really Unique - Here Is A Temple For People To Help Settle Down Abroad! India Is Really Unique - Here Is A Temple For People To Help Settle Down Abroad! Hawai jahaaz Gurudwara (Airplane Temple, Daoba, Punjab). I wonder why the two peacocks are there on both sides of the plane! Some reason should be there! I came across this news now...this seems to be a very old temple, but had not heard about this until now! Yes, I know that 90% of the youngsters nowadays want to go abroad for studies first and settle down there later! My two sons had gone abroad, one is settled down there and one has come back. Most of the children feel that the job satisfaction is a rare thing here. But I see that many youngsters are getting good jobs here nowadays and love to be with friends and relatives living near to their family and so come back home. Though this fraction is not much, yet! Mostly girls love to stay/come back here in many cases, to be near their family. Some girls who have not tasted the difficulties of running a home there without domestic help etc., which we are not used to, from childhood, still dream of 'living abroad'. I have met some people who had lived there in the US and the UK, come back with families in a group, after some years, stay in an area together, make themselves comfortable with all the facilities they had over there plus the domestic helps and live happily. Their friendships continue here too. They get jobs in good companies here with their experience, some continue to work for the same companies here and seems to be happy, living here now. The grown up children take some time to settle down though! Some families feel that living abroad is best since the nagging problems from relatives will be less! They can tolerate them once in two, three years for a month or so! I have read that mostly the Punjabis and Gujarathis dream of going to the US and Europe in our country than the youngsters of other States. I remember my son's school principal saying that a huge group of their school students are in California, for many decades now! They never feel that they are out of India, she said! My son seems to be happy, living there! Now, let me come to the topic of this post now! This Hawaai Jahaaz Gurudwara, in Punjab, is famous for devotees visiting them to pray for their dream of settling down abroad! We have got temples here for every wish...whether it is for getting good marks in school/colleges, for getting good life partner, for any ailments, for having a child (sometimes male child! ), for building a small or dream house, for getting good jobs, etc. etc. Once we get our wishes to our satisfaction, we go to the concerned temple and offer money or do mundan, etc. But, this temple is unique! Here, people donate small planes and pray that they should fly abroad soon...get visa without problem, mainly! This Sikh temple for Baba Nihal Singh is a very old temple/gurudwara and this tradition is followed by many for many years now. This village, Daoba's families have many youngsters living abroad and this makes people believe in this tradition! The gurudwara is most famous among Punjabi youths, who are anxious to immigrate to places like the UK, United States, and Canada, and believe that a prayer can help them significantly speed up their visa and other procedures. Satwinder Singh, a 21-year-old college graduate from a nearby village, says, “I have just put in my application for a visa to go to the UK and am here to ensure my passage by making an offering of an aeroplane.” Surinder Kaur, another devotee, says, “My son was trying hard to go to Canada but was denied a visa. 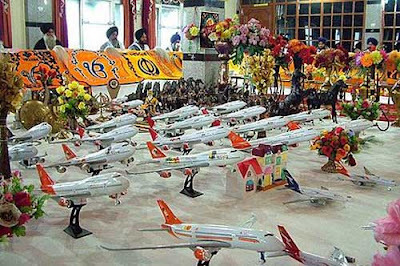 A friend suggested we offer the replica of an aeroplane at the gurudwara and it worked and he is now in Toronto.” So popular has this temple become that it is referred to as the “Hawai Jahaz Gurudwara” (Airplane temple). Several hundreds of airplane models are offered here and the temple often runs out of space to house them all. The shrine management has now come up with the solution of distributing the toys to children. “At least the children can play with them. We cannot stop people from offering them. In the end what matters is the faith with which you pray,”says head priest Bhai Manjit Singh. I loved the last line in this article: No wonder this temple is believed to possess a power even greater than that of immigration officials. Don't you think that our country is really unique?! EDITED TO ADD ON 30.4.13: My blogger friend Mr.SG has given information about a VISA temple near Hyderabad, in the comment section! Here is the link of the visa temple! This temple has no hundi, doesn't accept money or no VIP treatments for any visitor. This is unique, indeed! ha ha! We Indians and our fantasies! Thanks for this very amusing piece of info! MALINI: Welcome, Malini! When I read this article I couldn't believe! And this is an old temple! How come it is not in the news?! Not surprising since bribing Gods is one of our favorite past-time. When people are young, they feel that conditions abroad are ideal. After going there, they feel that this place is definitely better than India. After a couple of decades, they *have to* get used to it due to lack of any other options. They can't (yet) go to Mars!! But then, if living abroad silences some people, then it's good. Very interesting. Let those who live near Punjab go there for praying to obtain a visa. Those in the South, and those who cannot afford to go to Punjab, can go to Chilkur Balaji Temple, about 30 km from Hyderabad. It is located in the Rangareddy District. It is popularly known as Visa Temple. DESTINATION INFINITY: Working atmosphere is better over there, my son says! Corruption is less, comparatively! We need not be on our toes all the time, wherever we go, is another point! Well, some people, as you say, get used to that atmosphere! Don't think people can't go to Mars! It might happen soon! Many people in our family, well, from most of the middle class families, live abroad now. Some are very comfortable. Some wait to visit India and some would rather come back and stay here! I have got all types of people in our family! I like to 'visit' there...well, until now! Husband doesn't like at all! He is happy with his TV programmes and cricket matches! Every person is different, we should remember! SHAIL: Yes, I too liked the idea of distributing the toys to children! They would be very happy to have them, esp. poor children. SG: Thanks for the information about the VISA temple. I have included it in the post now! These news are really interesting, aren't they?! 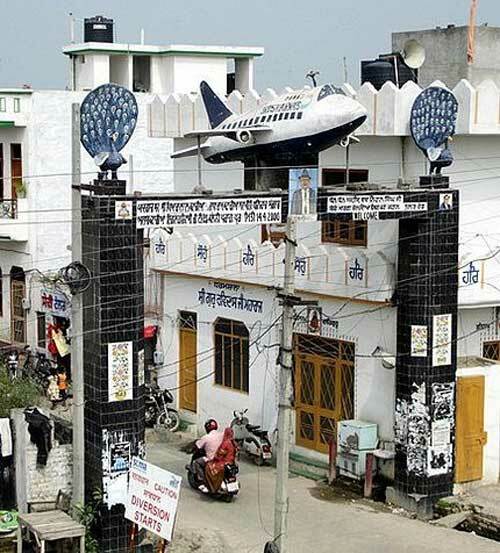 haha Hawai jahaz gurudwara.This sure is so unique. Enjoyed reading about it :). Interesting!Believe it or not, there's visa ganapathy, America Anjaneyar and even Valentine krishna temples in Chennai..Seriously., and people believe a lot on them.. Thank you for sharing information about this unique temple too! Giving those planes to the kids is such a nice idea too! RAHUL BHATIA: Now, I have come to know from the comments of my friends that there are many other temples on this subject (visa!) here, in Chennai too! Have a look at Anu's comment pl.! We are really funny people! PN SUBRAMANIAN: Yes, we are unique, indeed, Subramanian Sir! RACHNA: We have more temples like this, in Chennai too, it seems! ANU: Thanks for the interesting information about our Chennai temples! I am here for the past so many years, but haven't heard about them! Must ask my sis in law, just for curiosity! USHA PISHARODY: Yes, kids will be the happiest people because of this temple! Even in hyderabad there is one temple known as Visa Balaji...students who applied for student visa visit this temple and make to vow to circle the temple 101 times. It is interesting to know about this temple, and the way they give away planes for children to play. I have read about Visa temple in Hyderabad, and also about various other temples made famous because of specific reasons. It is nice when one reads about such things. I even saw in some Tamil program/ news that there is petition murgan temple in the South where cases that have no chance of winning, cases that take a long time to get justice etc get quick relief if one just goes and fills some form and pay some nominal amount to the temple, their prayers are answered immediately. I wish I had written down the name and place of the temple in South India, now there is no way to find out. I even googled but got no results. It can help people fighting cases that take a long time to get resolved. Regarding settling abroad, with the way things are in India , I to feel I would be better off living abroad, though corruption is everywhere, but it is mostly in very, very high level, it is not like in India, where the corruption starts at the lowest level and and also at the very highest level. There is no way in which we can do away our rotten system. There are no good hard working parties to vote too, each party is uglier than the other. We are caught in the middle of criminals, rapists, and swindlers, and goonda raj only works here. It is really a very sad situation. VARUNAVI: I know, Saritha. My relative who lives in New Jersey took me to one store where all types of Indian provisions, fruits and vegetables were available. The owner was a Sinhalese! We went to one area where all the shops were owned by Indians...we ate in a Punjabi restaurant and heard our filmy music. The road was dirty like India unlike other places over there! Typical Indian area! I mentioned about the VISA Balaji temple in the end of the post, Saritha! RAMA: I too liked to know that the toys were given to children! Anu says in the comment section that even Chennai has got some temples for speeding up VISA! I have also heard about the temple for solving cases! Yes, we, very badly need a good leader. Still, I don't think I would 'enjoy' leaving my home and country for a longer time! For me, India is our India always! SM: Yes, we can say either! இன்று நம் தெய்வீகப்பதிவர் திருமதி இராஜராஜேஸ்வரி அவர்கள் தன்னுடைய வெற்றிகரமான 900th POST ஐ, வெளியிட்டுள்ளார்கள். தாங்கள் மேற்படி வலைத்தள இணைப்புக்கு அன்புடன் வருகை தந்து, அவர்களை வாழ்த்தி சிறப்பிக்க வேண்டுமாய், அன்புடன் வேண்டி விரும்பிக் கேட்டுக்கொள்கிறேன். We are unique no doubt at all. But it hurts me that we don't leave even God to demand our wishes. 'Hamari Maange puri karo' but what do we give in return ?? I had heard about a similar temple in Hyderabad. Did not know about this one :) hehe.. wonder why Indians so obsessed about settling abroad?! BHAGYASHREE: Nothing! Our 'maang' becomes more and more! DEEPS: Yes, Deeps! If we are obsessed with something, people know how to use it! After writing about this temple, we seem to know about more temples in this genre in many cities! AVADA KEDAVARA: Balaji temple in Hyderabad! We are unique people, you know! ASHWINI SRIRAM: Yes, Ashwini, ours is a quirky nation! Even Chennai has got some temples for visa etc. I didn't know about it, before! Anu wrote in the comment section here! I agree with what the head priest said, all it matters is how strong your faith is. Worship any object with immense devotion and you can discover God in it! God is supposed to be everywhere and in everything but when we particularly want to see him in something, then he will show up in there! :) So it depends on where we search for God, if we search him inside our hearts, he will respond from within! SAI CHARAN: This is not the only temple for this reason...read the comments...many more temples are there, in Chennai and Hyderabad too! If you try for anything wholeheartedly, you will get it, Sai. Sincerity and hardwork is important. God is just a booster for our mind. The trend has already started changing...even IT people are coming out of it and are diverting their interests in other fields. Again, you have to work hard and be sincere in whatever you are doing...do whole heartedly.